The Horace Bushnell Promenade is the signature component of Hartford's Intermodal Triangle, and the first major implementation of the city's award-winning iQuilt Plan. The project creates a postcard-worthy walk along Bushnell Park from Union Station to Main Street, The Wadsworth Atheneum Museum of Art, Travelers Insurance Companies, and the University of Connecticut's new downtown branch. After years of prioritizing free flow of motor traffic at the expense of pedestrian safety, comfort, and amenity, the business community determined that improving the pedestrian improvements was worth the increased motorist congestion that may result. 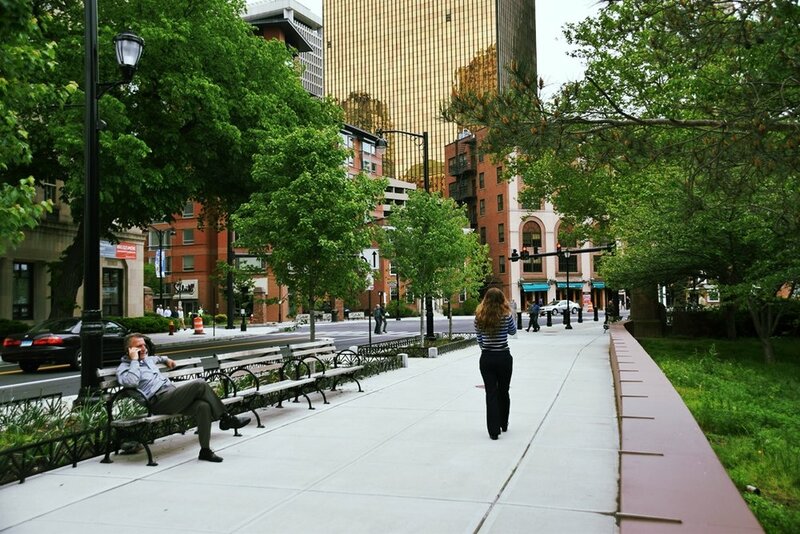 This project re-asserted walking as downtown Hartford's most important mode of transportation. The project implemented a road diet on the number of motor lanes in the street and turn radii at intersections. As a result, it dramatically narrowed pedestrian crossing distance between the park and the downtown at six major intersections, and transformed a 4-foot sidewalk between a tired iron pipe fence and the roadway into a generous pedestrian promenade framed by a low seat wall and ornamental fence on one side, and seating, plantings, and pedestrian-scale lighting on the other. In addition to the the graceful new seat wall along the edge of the park, the project added three new entry gages at key downtown streets, following the example set by existing historic brownstone entrances. The promenade anticipates future daylighting of the Park River, and is intended to support infill development on parking lots that currently dot the edge of the park by creating a true sense of place. Perhaps most dramatically, the Promenade included the reconfiguration of Gold Street on the Park's east end, creating a gracious open space at the front door of the First Church of Christ, highlighting Carl Andre's iconic Stone Field Sculpture, and effectively bringing Bushnell Park to Main Street - its first expansion since its creation as America's first publicly created municipal park in 1854. A new entrance to the park is across the street from the Atheneum and the Travelers, creating a welcoming arrival for employees and patrons, alike. As a public official, JVM Studio's Jonas Maciunas was responsible for collaborative project conception and grant application, budget development, engineering consultant selection, design oversight, coordination of City departments and partner agencies, public outreach and input solicitation. Suisman Urban Design developed the conceptual design, and BETA, Inc. completed engineering and final design.